When two halves of a transit bridge love each other very much, they exchange a special hug. That’s where light rails come from. Birds and bees do the same thing, as do Portlanders. But whereas we do it in relative privacy, the long-betrothed east and west portions of the as-yet-unnamed Tri-Met transit bridge will share their amorous embrace in the very center of town, observed by the public and a burly team of construction workers. At that romantic moment, dangling in midair, their overhanging lips will kiss and lock. Their massive poured-concrete undercarriages will bump and merge, and they will become one bridge, destined to bear tens of thousands of citizens across the Willamette every day of every year until tsunami do they part. 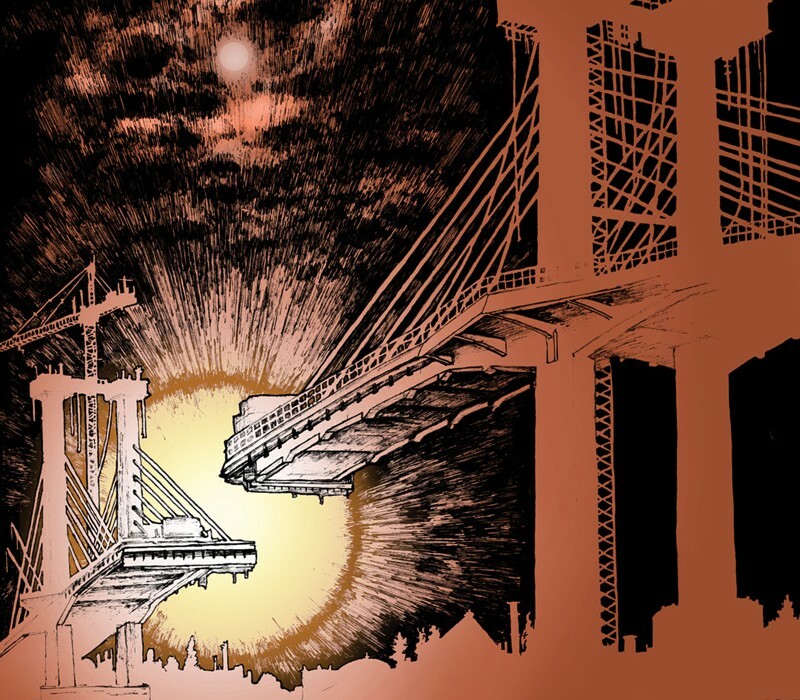 With the big day approaching, and with so much riding on the successful consummation of their architectural ardor, PDX Magazine decided to check in with the expectant superstructures of the bridge-to-be, to see how they’re handling the pressure. PDX MAG: It’s a lovely sunny day on the Willamette River. WESTERN PORTION OF THE TRI-MET TRANSIT BRIDGE: Indeed it is. Herons are croaking, carp are leaping. The wind is constant, but not unkind, and I am a very excited bridge. PDX: This beautiful spot above the Willamette will be your home for the next however-many-hundred years. WEST: I will be happy here, most definitely. And I know she will too. We were born to be together. PDX: She? Who is this she? WEST: The east side of the bridge, silly. My “better half,” if you will. PDX: I see. But how is that you see your better half as feminine? WEST: It’s her curves, of course. Doesn’t the way in which those smooth white cable sheaths glide up her back to the slender pillars of her mighty shoulders put you in mind of a Bolshoi ballerina? PDX: Yes, but you are also describing yourself. WEST: So what? We will be lesbian ballerinas together, okay? It will be rad. I cannot wait. PDX: How well do you know each other? WEST: We’ve never actually met, in the strict sense, but we know all the same people. I’ve lived next door to her my whole life, watched her grow, watched the sun warm her smooth gray surface, seen her spread out her cables and begin to reach toward me. She’s so graceful, so elegant … so tall. I have to admit, tallness turns me on. Short bridges just don’t interest me. Height dictates a lot in relationships, they say. Height and smell. It’s funny, she’s so close, but I still can’t quite smell her. Have you smelled her? PDX: Cured concrete and welding smoke. WEST: Wow! That is hot! February can’t come too soon for this bridge-half. I only hope she feels the same as I do. PDX: I can’t imagine how she could feel otherwise. EASTERN PORTION OF THE TRI-MET TRANSIT BRIDGE: Sturgeon, shmurgeon. I gotta get a move on. EAST: Please, seriously … Can you get me out of here? PDX: I don’t know. No offense, but you’re heavy and severely bolted to the ground. EAST: It’s just, this bridge thing, I don’t think I can go through with it. It’s not me. PDX: It’s quite normal to be nervous, with the big day so close. EAST: I’m not even two years old! I’m too young to be making big commitments. PDX: Forgive me, but it’s not entirely up to you. The taxpayers have certain expectations. EAST: Shmaxpayers! Let them eat sturgeon. Don’t I have rights? I’m young and wild and free, I can’t be shackled to Milwaukie like this. I was meant for bigger things. PDX: You’re already quite big. As is your other half. EAST: Please don’t talk about him. It’s too hard. I mean, I love him and everything, but the thing is, the problem is, the situation is … there’s someone else. EAST: Yes. Someone fun, and important. A real big-shot down in Salem, who has been writing me such beautiful letters. EAST: More of a bridge. A very special bridge, who’s going to get me out of this podunk town. We’re going to build a new life together, doing something completely different. PDX: There’s not a lot of non-bridge opportunities available for half a bridge in today’s job market. EAST: I could be a football stadium, or a bomb shelter, or part of a freeway in China! PDX: But what will the western portion of the bridge do when you’re gone? EAST: I don’t know. But he’s a very wonderful bridge-half. I’m sure he’ll find somebody to be special with, and do all that traffic-moving bridge stuff. Without me. Sniff. PDX: Why do you see the other half of the bridge as male? EAST: Are you kidding me? Look at the size of his pylons. PDX: But the same could be said of you. EAST: So? So what? We are non-traditional bridge components who love each other. Is that too freaky for you? PDX: But if you love him, why are you trying to escape your destiny? EAST: I … I’m too young for traffic, okay? I just don’t want it. I’m not ready. Traffic is gross. What do I even know about light rails? EAST: Fear, shmear! Now seriously, do you know a local engineering firm that can move large structures? Any leads at all? If I don’t get out of here soon I’m going to freak out and collapse. Please, PDX Magazine, you’ve got to help me. PDX: Okay, okay … I can ask around. THE SELLWOOD BRIDGE: I know some people, but they’re not cheap. PDX MAGAZINE: It’s an overcast day on the Willamette River, and Portland’s newest bridge is having a prenuptial crisis. SELLWOOD: That’s kids today for you. Fickle, flighty, never appreciating what they’ve got … oh, my aching knees. PDX: They’ve been planning for this thing their entire lives, and now this happens. SELLWOOD: Moving will cost a pretty penny, I’m telling you. In my day it was easier. PDX: You can tell they love each other. Why can’t they just admit it and be happy? SELLWOOD: First you got your temporary superstructure, your steel guys, your piling guys. Then there’s impact statements. There’s the Friends of Fish. PDX MAGAZINE: I think the whole thing’s crazy. She’s throwing away her future! SELLWOOD: Unions want a cut, the State, the Feds…and the Great Spirit will want his palm greased, too. The permits alone could kill a horse. PDX: Someone’s been sending her love letters, on the eve of her wedding. Who would do a reckless thing like that? SELLWOOD: It takes lasers, and laptops, and guys with degrees. It’s easier to move a river than a bridge. I tell you, it was different in my day. Back then, if the Bonneville Dam got crooked after a big storm we’d just string a couple big iron chains to a tractor on shore, rev up the diesel and give it hell. PDX: She says she’s too young for traffic. SELLWOOD: Ha! So am I, and I’m 89 years old! What did she expect? Does she think she’s going to run off and be a circus bridge? Join the French Foreign Legion? Move to Alaska and be a bridge to nowhere? Still, I know the feeling. Commuters—yeesh. They make you sticky. And talking of, Mac: rush hour’s starting up here, and I gotta straighten up and focus or I’ll go all to pieces. Interview’s over, okay? PDX: I’ve got to try to talk her out of it. SELLWOOD: “Her?” Whaddya mean, “her?” What makes kids today assume one side of a bridge is a fella and the other one is a—hey, where’d you get to? PDX MAGAZINE: Hello, it’s me again. It’s a moderately comfortable, overcast early evening on the Willamette River and…what the heck? PDX: Hello? Eastern portion of the Tri-Met transit bridge? Where are you? WEST: I’m going to be sick. PDX: Please don’t worry. I’m sure there’s a reasonable explanation. I’m sure she’ll be back before you know it. I’m sure this whole thing is one big misunderstanding. PDX: That can’t be true. WEST: She hates me because I’m fat. I’m fat and ugly. PDX: You are a bridge superstructure, not beholden to conventional standards of beauty. In architectural terms, you’re a “ten”! WEST: I bet she ran off with some slick smooth-talking, ne’er-do-well with cash and connections. PDX: I wouldn’t jump to that conclusion. WEST: I bet she got cold feet, decided she couldn’t get chained down. PDX: I wouldn’t leap to that deduction. WEST: You’re right. I bet she just doesn’t love me at all. PDX: Just which smooth-talking ne’er-do-well do you think might be at fault? PDX MAG: Aha! Found you! THE COLUMBIA RIVER CROSSING: Ha, ha, ha! PDX: What have you done with our bridge? CRC: Oh, have you lost a bridge? A whole one? Sorry, haven’t seen it. PDX: Half a bridge, then. Our demi-bridge. Where is he or she or it? I have it on good authority that you are just the sort of nefarious cad who might have been writing him or her or it certain letters of a leading and prurient nature. CRC: Ha, ha, ha! I’m sure I haven’t the foggiest notion. But wherever your missing bridge might have gotten off to, I hope that she or he or it, is not planning to re-apply for federal transportation funding. There’s only so much bridge money to go around, you know! Ha, ha, ha! PDX: Your laughter is nefarious, and also cad-like. I hate it. CRC: Ha, ha! Sorry, it’s a nervous tic. I only seem to do it when I’m feeling proud of myself for being evil. PDX: You’ve been making all kinds of impossible promises, again, haven’t you? Filling him or her or it up with crazy notions that fall entirely outside the Metro long-term regional transportation plan! How could you? CRC: It’s a bridge-eat-bridge world, I’m afraid. Ha, ha, ha! PDX: Stop that! You’re not even supposed to exist anymore. The Tri-Met bridge is fully funded, but your funding was cut! Nobody loves you, nobody wants you. Why do you insist on lingering on in our region, stirring up trouble? CRC: Bridges gonna bridge. Don’t hate the player. PDX: In fact, by now I’m sure our errant demi-bridge has realized your treachery, and is on his or her or its way home to reconcile with his or her or its mate—who is also a him or a her or an it, I’ll have you know, and there’s nothing wrong with that! CRC: Ha, ha, ha! I wouldn’t hold your breath! It’s a long way back from Salem! CRC: No, I don’t! That is…or rather…I haven’t the slightest idea what you mean. Did I just say that? I’m sorry, I thought that was my sneaky thinking voice…oh, drat. WEST: It is a cold and quiet moonlit evening on the Willamette. Perch are perching, cormorants are snoring, and I am sad and alone and made of cement. WEST: Oh, my goodness! You’ve returned. EAST: I’ve been a fool. WEST: What’s happened to you? You’re soaking wet! Where have you been? EAST: Swimming. I got as far as Oregon City, but I couldn’t jump the waterfall. WEST: Look at you! Your cables are all tangled, and there’s a wakeboard dangling from your underside. Your cofferdam is full of trout! Your construction crew is going to be livid. Why, why, why are you so wild? Why can’t you sit still? EAST: I have transit in my soul. When I sleep I dream of movement, of the sway of acceleration, of expectant arrivals and triumphant departures. WEST: As do I! Every day! The music of the rails! EAST: The poem of the open road! WEST: The epic struggle of the bike lane! We could have all that! All of it—right here! EAST: But now I’ve ruined everything. I’m so sorry. WEST: Then why did you come back? What happened to your amorous correspondent? EAST: Flimsy lies and puffery, all of it. WEST: Well, that will teach you to trust a document from Salem. EAST: Is it too late for us? WEST: I’m just not sure. EAST: Will you ever trust me again? WEST: Eastern side, you complete me. I’m nothing without you. Together we could span this river and knit these communities together like a warm scarf. We could take our place among the highways and the railways and the trails, the long proud ribbons of possibility that course through the entire continent. EAST: Oh! I want to have your light rail! Will you carry busloads and trainloads of dignified humanity to and fro with me? Will you stand with me, arm in arm, as fishermen snare their lines on our railings, and children toss paper airplanes, and sweaty bicyclists scream expletives and struggle to repair their flats? Eagles will nest on our parapets! It will be beautiful! WEST: Will you be my other half? Will you join me forever and make this frankly quite desirable swath of riverfront property your home? EAST: Yes! I will! I must! I do! That is…if you’ll still have me. WEST: All is forgiven, my darling. Now hug me!